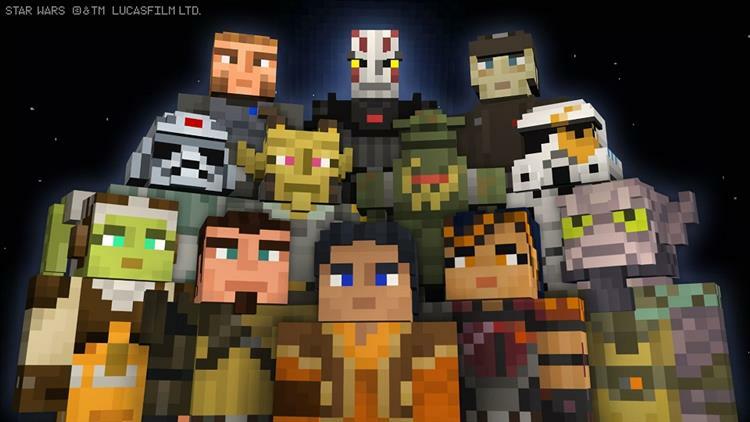 Last November Minecraft players were treated to a Star Wars skins pack that included skins for characters from Episodes IV through VI, the classic characters of the franchise. Now we have skins for the newest characters in the franchise, those from the Disney series Star Wars Rebels. Whereas Star Wars: The Clone Wars was set during the three years between Attack of the Clones and Revenge of the Sith, Star Wars Rebels takes place five years before the events of A New Hope and tells the story of the Revellion's beginnings as the Empire spreads tyranny throughout the galaxy. I've seen several episodes of The Clone Wars but very little of Rebels, so I can't really go into more detail other than what the website goes into, but you can check out majornelson.com for more info on the character packs as well as where to purchase them.